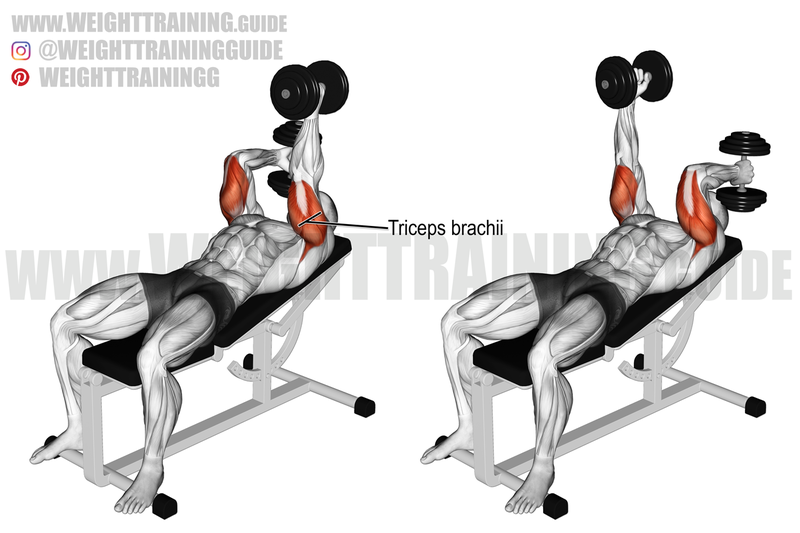 Holding a pair of dumbbells, sit on a flat bench and rest the dumbbells on your knees. Lie back on the bench and, as you do so, kick the dumbbells up into position over your chest, one at a time. Spread your legs and plant your feet flat on the floor. Bend your elbows a little, and internally rotate your shoulders so that your elbows point out to the sides. Arch your back and stick out your chest. Inhale as you lower the dumbbells in an arcing motion to your sides until you feel a mild stretch in your chest. Exhale as you reverse the motion until the dumbbells are nearly vertical. Keep the movement slow and deliberate. There’s no need to bring the dumbbells together at the top of the movement because once they are vertical, there is almost no resistance to work against. Arching your back and sticking out your chest will reduce the pressure on your shoulders and focus it on your chest. See the first video. Internally rotating your shoulders (so that your elbows point out to the sides) better isolates your pectoralis major because it brings the origin and insertion of the muscle into better alignment. Since you can’t go heavy with the dumbbell fly (because doing so is dangerous), the exercise is not a mass builder. As an isolation exercise, it is useful if you want to warm up your chest, pre-exhaust it before the compound chest exercises, or flush it at the end of a chest workout. The dumbbell fly doesn’t target your inner chest. This is a popular myth. Isolation of your inner chest is impossible. The only ways to produce more inner chest definition are to build your chest using compound exercises and to reduce your body fat. Another popular myth is that the dumbbell fly stretches your pecs to give you a broader chest. It doesn’t. See the second video. Instead of the dumbbell fly, I usually recommend the cable cross-over for reasons explained on the cable cross-over page. Ꮩery ѕoon this site wіlⅼ be famous. That’s my prediction. Watch. Good one! but do it on the floor for safety.